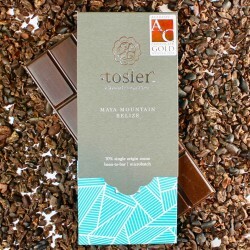 Tosier was created by Deanna Tilston, who is passionate about real chocolate so set out on a personal journey to learn how to make her own bean-to-bar chocolate. After taking a number of chocolate courses and much hard work she travelled to the US to buy the equipment she needed - and this was the point of no return! 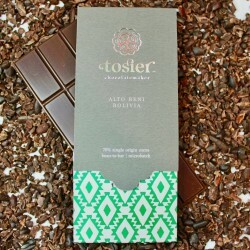 All Tosier chocolate is handmade by Deanna in small six kilo batches, so that she can keep a close eye on every stage of the process to produce the best quality chocolate. 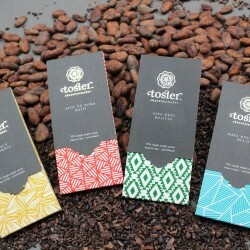 Her chocolate is made using the highest quality cocoa beans, sourced from amongst the top 5% of the world's cocoa. 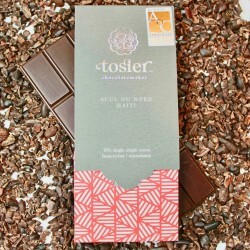 Tosier is part of a transparent supply chain which ensures that farmers get a fair price and which creates a meaningful impact for the cocoa-growing communities. Winners of the Academy of Chocolate UK Rising Star Award 2018, with their bars winning a Gold and two Bronze awards at the Academy of Chocolate Awards too. Tumaco, Colombia | 2017 Harvest | Bean-to-Bar Chocolate Bar (Multipack) Multiple sizes available.